Faculty of Humanities of Eötvös Loránd University offers a wide range of bachelor programmes to international students who intend to obtain a bachelor’s degree at ELTE and who want to complete the entire program in English at ELTE in Budapest, Hungary. Courses of the programs are in English. Courses for philology degree programmes in foreign languages at the Faculty of Humanities are always offered in the given language. The language of instruction and the language requirements of a particular program are indicated in the description of the given program. 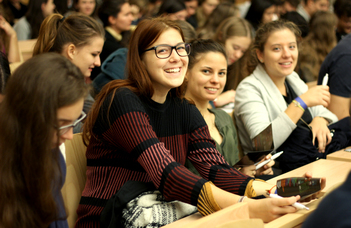 The bachelor programmes are accredited by the Hungarian Accreditation Committee. Diplomas issued at ELTE are acknowledged worldwide and course credits are transferable in all countries of the European Union. The program is offered by the School of English and American Studies. The program may be completed as a major program or as a minor program, the latter is only available for students who are in another major program at ELTE. Students taking the program as a major opt for either the English or the American track at the end of the first term. The three-year long programme does not provide teaching qualifications. Students in the English studies track within the English and American Studies BA program are offered a chance to acquaint themselves with the foundations of information technology and typography in the first phase of their studies. This is followed by a series of seminars and lectures aimed at developing students’ competence in using English as a language of global communication, academic writing, and everyday oral argumentation in a scholarly and business environment. Students will thus attain the foundations of academic research, evaluation and critical thinking in English literature, British and American socio-political history, and develop an understanding of the linguistic levels of description and analysis of English (phonology and syntax). Students opting for the American Studies track within the English and American Studies BA program are given the opportunity to acquaint themselves with the background and idiosyncratic features of American history, culture, literature, and the American variety of English. By focusing on these areas of research, the aim of the American Studies track is to impart the students with the foundations of critical thinking and academic research in order to prepare them for future studies or for successful endeavours when entering the job market. The German Studies bachelor's course aims to train professionals In the German Language in speech and writing, who are capable of a high level (according to the common European language system, at least C1 level) use and acquire in-depth theoretical and practical information related to German in the areas of culture and history. These skills and knowledge enables the student to perform managing and organizing tasks for tourism; the economy, the media and the press; culture and public administration; the general ability to translate and interpret texts. BA system course is planned to be 3-year term. The course is divided into two periods: the first year as a basic course the second and third year as main course. At the end of each period there are complex examinations. At the end of the basic course, students have Filter examination and at the end of the main course they have Final examination. The BA programme in Netherlandic Studies aims to provide the fundaments (language, linguistic, literary and cultural studies) necessary for the philological study of The Netherlands and the Flemish part of Belgium to its graduates. Our programme results in graduates with not only proficiency in the Dutch language, but also a familiarity with the societies and cultures of the countries where Dutch is spoken as the first language. Our graduates will be familiar with fields and methods of academic research and will be able to meet the requirements of the MA course. • Students are eligible for admission to MA programmes. The BA system course in Scandinavian Studies aims to train professionals in Danish, Norwegian and Swedish who are able to use one of these languages on advanced level, both in writing and speaking (level C1) and work in their professions suitably. Moreover, they gain available theoretical and practical knowledge in Scandinavian literature, culture and history. The course aims to prepare students for specialized Master courses. The aim of the Hungarian BA program is to provide students a professional level of Hungarian in the language and its literature. The course offers the language training based on the experience of the Hungarian as a Foreign Language Department of Eötvös Loránd University, and also emphasises the importance of literary and cultural studies. Eastern, and Eastern-Central Europe are in the position to become central actors in cultural and economic connections between Asia and Europe. This can be seen as a developing trend that will grow in the coming years. Budapest, as the capital of Hungary is one of the hubs in the region and the centre of Hungarian culture. Students of the Hungarian BA program will specialize in Hungarian as a Foreign Language. The professional understanding of not only the Hungarian language but also Hungarian literature and culture, and several of the cultural factors that define Europe on an international level will position graduated students to become actors in this quickly developing economic and cultural field. Eötvös Loránd University is located on two main campuses around the city centre of Budapest and boasts nearly 30,000 students and a thriving university life. It is one of the largest universities in Eastern-Central Europe and houses the world’s most prestigious institutes for the study of Hungarian language, tradition, history, culture and art. Students enrolling in the course will be learning from many academics who are leading figures in their fields, guaranteeing the highest possible standard in training. Le but des études en licence est de former de spécialistes de la langue et de la culture françaises qui, munis d’une solide connaissance théorique et pratique, seront capables d’exercer leur métier dans les domaines les plus divers, inter- et pluridisciplinaires. Les titulaires de licence atteindront un niveau nécessaire pour continuer leurs études en Master. Les titulaires de licence auront une connaissance approfondie de la langue écrite et orale, ainsi que de la culture françaises : ils seront capables de traduire des textes, de remplir la fonction d’interprète au niveau élémentaire, d’assurer le lien entre la France et la Hongrie dans les domaines culturels, économiques et sociaux. Ils témoigneront également d’une motivation et d’un dévouement particuliers envers la langue et la culture françaises, ainsi que de la capacité de mettre en application avec créativité les connaissances acquises. Scopo del corso di laurea è di formare esperti che dispongano di conoscenze teoriche e pratiche nel campo della lingua e della cultura italiana e più in generale delle scienze umane e che grazie a queste conoscenze possano esercitare creativamente la loro professione a livello teorico e pratico, inter- e multidisciplinare. I laureati disporranno di conoscenze teoriche sufficienti per poter continuare gli studi nella laurea specialistica (MA). I laureati saranno in grado: di usare la lingua italiana in orale e in scritto a un livello corrispondente al livello C1 delle norme europee; di utilizzare gli strumenti generali di studio e le tecniche fondamentali di ricerca correnti nello studio della lingua e della cultura italiana; di capire globalmente, riassumere, tradurre a livello basico testi di carattere generale. The aim of the instruction is to train specialists in Portuguese, Brazilian and African Portuguese cultures and literatures. At the beginning of the Portuguese studies we offer very intensive language lessons for the students who don’t speak the Portuguese language. After the history of Portugal and the Portuguese word, Brazil and PALOP (Portuguese Language Speaking African) countries, we initiate the students to the literature do Portugal and the Portuguese speaking countries and offer courses about the different cultural aspects of these countries. In our specialized courses the students can get to know the cinema, theatre, music and fine arts of Portugal and Brazil. The BA-training admits students without knowledge of Portuguese language too, we have very good language teaching. Our specialty is the close cooperation with the Portuguese Camões Institute and the Galego Language Centre in Budapest, so we can offer possibilities of Portuguese Language Exam and learning Galego and Catalan language and culture. The Department of Romanian philology was founded in 1863. It was the first chair of the Romanian language and literature in Europe. The Department has several contracts with universities (University of Bucharest, Babes-Bolyai University of Cluj Napoca, University of Oradea) and academic institutions (George Bariţiu Academic Institute of History) from Romania. Diplomas from our department, based on European regulations and the Romanian-Hungarian bilateral agreements are recognized in Romania and also in Europe. The aim of the study programme is to train professionals of the Spanish language and culture who possess theoretical knowledge and practical skills within the domain of social sciences in order for them to carry out multi-faceted, inter- and multidisciplinary vocational tasks. Graduates have ample theoretical knowledge to continue their studies in the second cycle. BA degree holders will: have comprehensive knowledge of the Spanish culture be able to communicate in French both in writing and in speech at an advanced level be prepared to study the Spanish language and culture with state of the art methods and techniques of research comprehend texts in general and be able to summarise, translate, and interpret them be able to make use of their knowledge of the social, economic, and environmental problems of Hungary, Spain, and Latin-America in their careers.